Rafael Nadal- The King of Clay. His first major win was against Ramon Delgado in Mallarco Open who famously ousted Pete Sampras from 1998's French Open. This was 2002, Nadal was 15 years and ten months old. Even though he was ousted by Olivier Rochus in the round of 16, the world started to notice this young man. Rafael Nadal Parera is a name which is looked upon with utter respect in the world of tennis. The 11 times French Open champion and the current no. 1 tennis player in the world is a glowing source of inspiration. His story is worth telling. Nadal is extremely aggressive tennis player especially in baseline rallies and has a unique technique. At the age of 32, Nadal clocks the forehand revolution of 3,200 on an average his highest being 4,200. But forehand is not his speciality. He is known for his heavy topspin groundstrokes and that includes the Nadal backhand trademark. Being a left-handed player, the grip he employs in his dominant hand (the racket hand) is the Continental grip. The tennis grip he employs on his right hand (non-racket hand) is the Semi-Western grip. The Semi-Western grip allows Rafael Nadal's backhand to produce more topspin than the Eastern forehand grip. This makes him different from other left handed-players because most of them use the Eastern forehand grip on their right hand. Aside from this, he has a speedy footwork. This very quick and fast footwork of Nadal helps him cover the court that not many professional players can do. His speed and agility make him a good defensive as well as an offensive player. Let's take a look at some of the key highlights of Nadal's career. Rafael Nadal has dominated the French Open ever since his first tournament in 2005. He defeated his arch- nemesis Roger Federer in the finals to begin his reign in this prestigious tournament. He also became the first teenager to win a Grand Slam title as a teenager. After this, there was no stopping for the Spaniard. He has appeared in 11 French Open finals and has won all of them. Roland Garros has seen the best of Nadal. His stats there are mind-boggling. Since 2005 till 2018 he has lost just 2 matches at Roland Garros (2009, Robin Soderling; 2015, Novak Djokovic) and pulled out of the tournament in 2016 due to a wrist injury. This makes his record 86-2 in French Open which is outstanding. 2018 saw him winning 11th French Open title by defeating Dominic Theim. 2018 French Open - Nadal wins, Again! With 17 grand slam singles titles to his name, he is the second on the list. Federer tops it with 20. He has reached 24 grand slam singles finals, 2nd all time. He is the youngest player in the Open Era to win all majors (the Australian, French, US Open and Wimbledon) at the age of 24 years old. He is also the proud member of the Career Golden Slam club (winner of all the majors and Olympics). He is an 11-time French Open champion, 3-time US Open, 2-time Wimbledon and one-time Australian Open champion. 2004 brought new heights for the Spaniard. Not only he managed to reach the third round of a major Grand Slam, the Australian Open, Rafa also played his first match against Roger Federer, then no.1. It was the Miami Open and Nadal won. One 17-year-old boy defeated the world no. 1. This match not only pushed up Nadal's career but also saw the starting of one of the biggest sports rivalries in the sporting world. Federer with 20 total major titles and Nadal with 17 are first and second on the men's all-time list for the most majors titles and hold numerous other records between them. 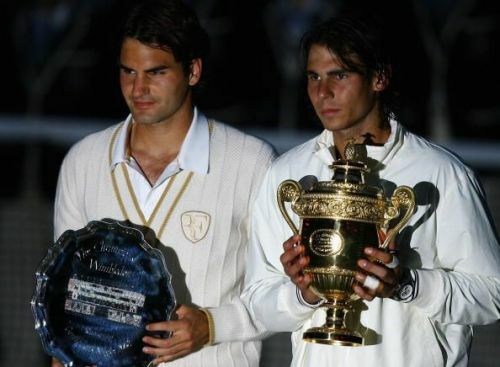 They are the only pair of men to have finished six consecutive calendar years as the top two players on the ATP list. Statistically speaking out of their 12 meetings in majors, Nadal has won 9 of them. Nadal leads 5–0 at Roland Garros, while Federer leads 2–1 at Wimbledon and Nadal leads 3–1 down under. The two have yet to meet at any stage of the US Open. In Grand Slam finals, Nadal leads Federer 6–3. Out of their 38 matches, Nadal leads on clay (13–2) while Federer has the edge on both hard courts (11–9) and grass (2–1). Federer has been more successful than Nadal on fast courts because he hits a flatter forehand and has a faster serve. Grass and indoor hard courts are faster surfaces, so Federer's flatter shots there result in a lower bouncing. Thus, Nadal's topspin is less effective on the faster surfaces but is most effective on slower courts such as clay. Nadal has an overall stronger groundstroke game making his almost unbeatable on Clay. The greatest match between them is said to be the 2008 Wimbledon final. After 4 hours and 48 minutes of play, Nadal defeated Federer 6–4, 6–4, 6–7(5–7), 6–7(8–10), 9–7. It is widely regarded as the greatest match in the history of tennis. The struggles of 2015 and the revival. His career took a dive due to his injuries and for the first time in 10 years, he dropped to no. 10. Experts stated this as the end of his career as his wrist injury worsened. Apart from the Olympic gold in 2016 things didn't look good. He also pulled out of French Open. But this resting period helped. He performed well in Australian Open before losing to Federer in the finals. His revival began with him winning Madrid Open. Clay embraced her son. He defeated Stanislas Wawrinka to win his 10th French Open. At a point when everyone considered his career to be over, he ended 2017 as the World no. 1. In 2018 not only he registered his 400th win, he won French Open for the 11th time. 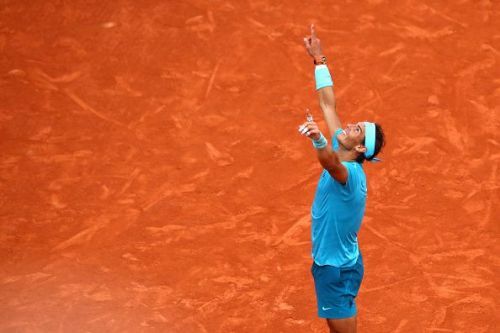 Nadal went on to win his 11th title in Barcelona in straight sets, becoming the first player in the open era to win 400 matches on both clay and hard. The win marked his 20th ATP 500 series title, which put him back atop the list of most ATP 500 titles, tied with Roger Federer. It also marked his 14th consecutive season with at least one ATP 500 title. Nadal also won his 33rd Masters 1000 Title in Canada in straight sets in the final. Rafa is a philanthropist and an avid football fan. He is an ardent Real Madrid fan and also holds shares RCD Mallorca. He is one of the finest in the Open Era and is one of the jewels who'll always shine.